Thats $3,000+ In Profit Every Month!For Each Pay-Per-Click (PPC) Campaign! Now that you have seen the proof and I have your attention, let me tell you that 95 percent+ of the Internet marketers cant get stats like these, simply because they dont know the winning AdWords strategy that I know. 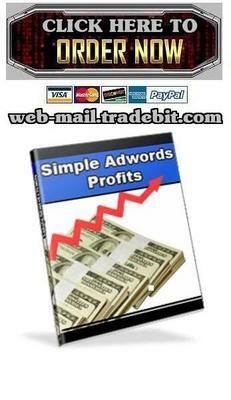 But dont worry, I am here to show you exactly what I do to get those profits from each of my AdWords campaigns. So you can be making exactly that in a few minutes from now. A few months ago, I was where you are right now. I was wasting my hard earned money buying a lot of $47, $97 and even $197 eBooks from the gurus that claimed that their information would make me rich. But what a deception, it feels so bad to spend that big amount of money for each eBook just to find out that their information is useless. Their sales letters are full of hype and exaggerated prices, and they deliver very poor information. I tried everything that I read from the gurus. I was spending my money in Google AdWords. I was barely making a few sales, but losing money because my AdWords costs were higher than my total sales commissions. Until I found a unique Google AdWords strategy, a strategy that pulled my profits from negative to 98 percent+ every single day. What I do in my AdWords campaigns is so simple, and maybe obvious. But the funny thing is that almost no one does it! Thats why 99 percent of the Internet marketers fail at AdWords. This is why I wrote the Simple AdWords Profits report for you. Because I want to show you exactly my own strategy that makes me get such high sales and high returns in each of my Google AdWords campaigns. I am revealing my strategy because I once was where you are right now, and I know the feeling of wasting money in PPC and making no profits. Hoping to have someone to tell me what to do to finally profit from AdWords. But that is no more! Thanks to my AdWords strategy that I have been using lately, you will be pulling big profits from any AdWords campaign just like I do. Those Are Great Online Profits.... But What If I Dont Know Anything About Google AdWords, Or Even If I Have Never Used Any PPC (Pay-Per-Click) System? It doesnt matter if you have never used Google AdWords or any other PPC system, or if you are a PPC intermediate user. This report covers everything from the beginning so even people who have never used AdWords or any PPC system, will be taken by the hand to get started the RIGHT WAY, using my own AdWords strategy for big and quick profits. If you are serious about making money online in 2008 with a proven, risk free strategy, you will get this report right now and read it today. Do you want to know what it will cost you to get this incredible money making information, information that will blast your profits through the roof? Yes, for the price of a fast food dinner you will have all of the information you need to make big profits from every Google AdWords campaign that you start.